Back in July, it was reported that Donald Trump had nominated yet another man plucked straight from this musical number in Pocahontas for an important job that he is not remotely qualified for. 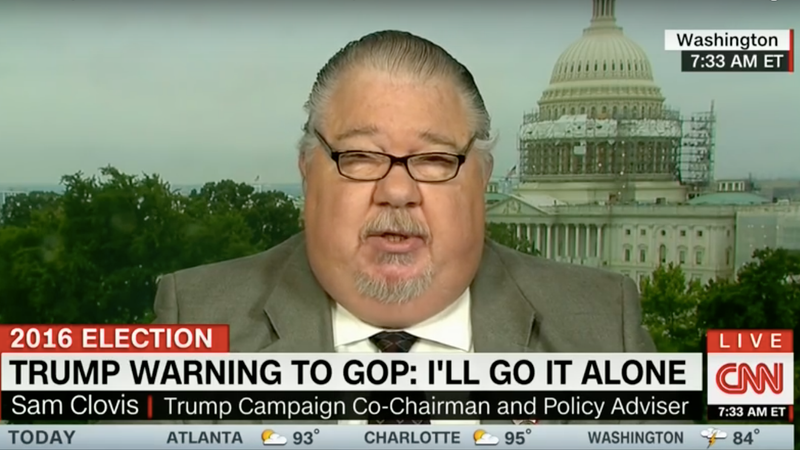 This one’s name is Sam Clovis, a climate change denier and non-scientist up for the USDA’s “chief scientist” post, which requires Senate confirmation. “This goes right in line with Tom Perez who is a racist Latino and goes to (inaudible) who is a racist Latino, Eric Holder who is a racist black,” according to a transcript of the show obtained by CNN’s KFile. Clovis similarly labeled Holder “a racist bigot” in a blog post from April 2012. Clovis doesn’t make clear in either instance why he believes Holder and Perez are racist. Want more? Clovis also has a fascinating theory that the term “climate change” is derived from some kind of socialist conspiracy to make every part of the planet have the same weather. That’s a new one! Clovis told Iowa radio host Jan Mickelson in June 2013 that climate change wasn’t settled science and argued that progressives changed the term from “global warming” to “climate change” to imply they were going to create the ideal climate around the world. Indeed, Sam Clovis. It is very nonsensical. What Can I Even Say About Stephen Miller&apos;s Press Conference Today?